Norton Antivirus 5.0 is the newest and greatest product release from the world's leader in antivirus technology. Numerous antivirus products claim to be able to detect a great many virii, but none can match the dependability of Norton AV. We have all heard stories of other brands being installed on a system, but it was Norton that found the virus. Yes, detection is a wonderful thing, but once a virus is detected it comes done to what the product can do. After all, that's one of the main reasons people buy antivirus products; to protect their system as is. Norton can clean and quarantine whereas many scanners can do nothing except delete, obliterating the file. Norton Antivirus 5.0 has many new features. It not only defends against virii, but also protects users against trojan horses (back orifice etc), internet based threats such as malicious code (Java, ActiveX), and hoaxes (goodtimes, Bill Gates email) aimed at inexperienced users . Symantec's patented Bloodhound Technology continues to seek out virus-like activity for known and unknown viruses. One can also recall Symantec's announcement of being in partnership with IBM in their antivirus endeavors. 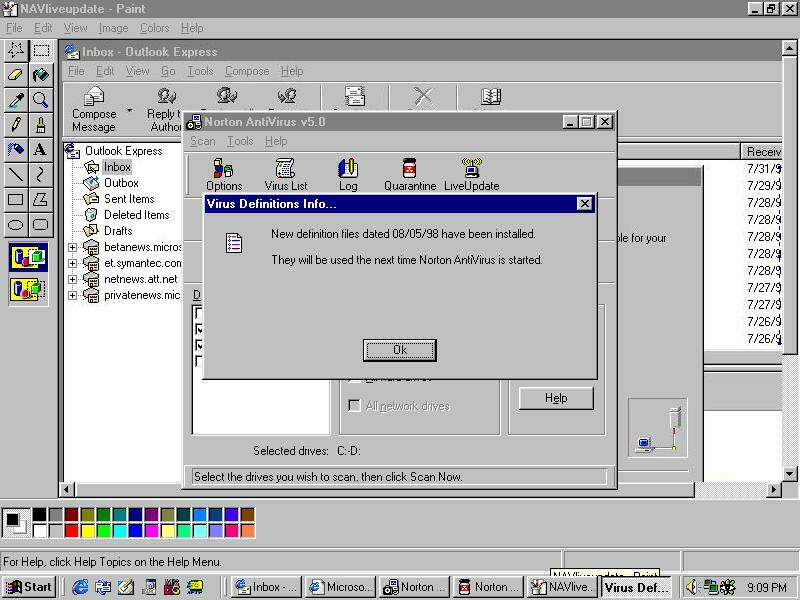 Virus-like behavior dectection is one of IBM's stong points, despite the UI that is a great product. The best of IBM has molded together with the best from Norton. Liveupdate will provide more frequent virus definition updates to make sure nothing gets by. 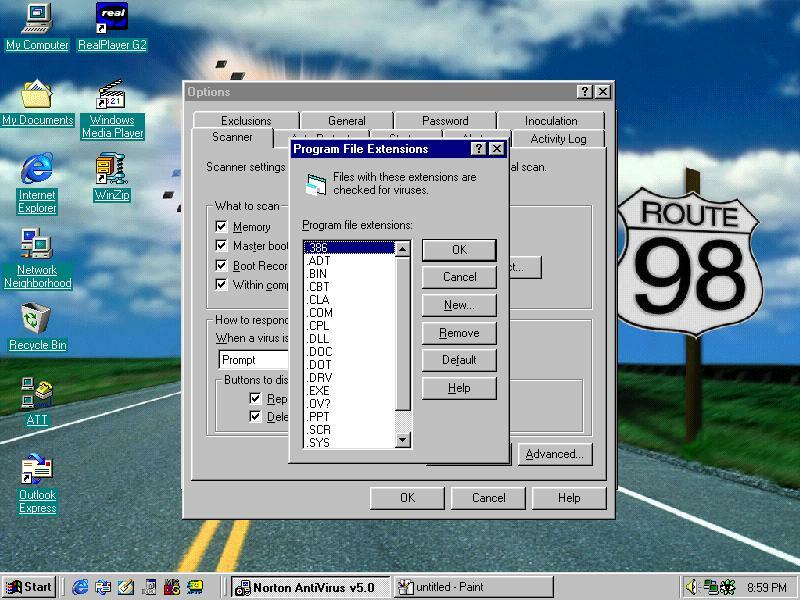 When one comes across a virus, the option to quarantine the particular file(s); in order to safely view the file, is an added plus for this new version of Norton. Once the virus infected file(s) is quarantined to a centralized location, it can be submitted to Symantec's SARC (Symantec Antivirus Resource Center) which then will be received and examined. Appropriate instructions and information will be returned to the user for use against the virus. Or if the file is not infected, a reassuring email will be sent to users or a very nervous network administrator. One really great new feature is the ablility to load autoprotect without having to restart the computer and load it at startup. So, virus protection will be offered without having the annoyance of a long startup or lost system resources every time your computer loads. This is easily accomplished through an easily accessible button on the main console of Norton Antivirus. So that means no poking around through options and settings. 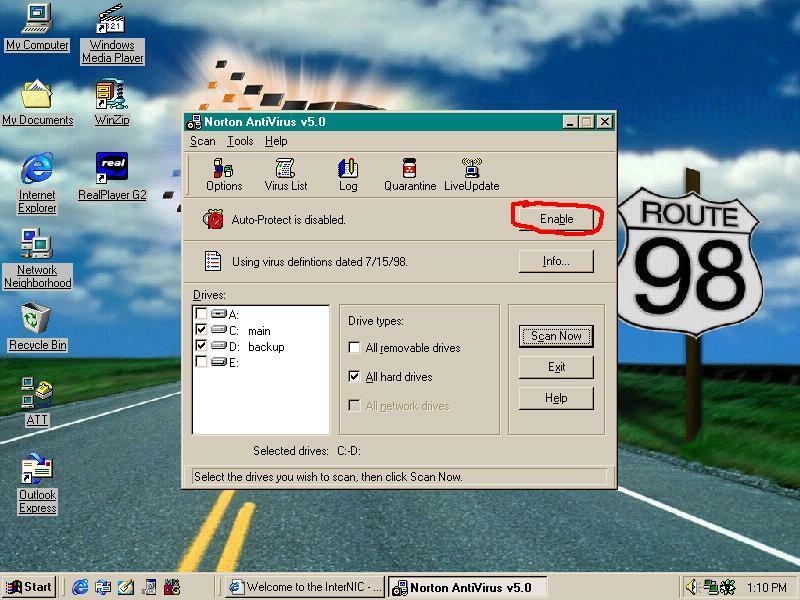 On a similar note, Norton takes advantage of technology included in Windows 98. Instead of loading Norton schedular (taking up more resources and pro-longing startup) Symantec decided to use task schedular. Why not use what the OS provides? It seems to be an easier, more OS "integrated" feature that will allow users easier access to product updates. No antivirus program or "suite" will scan more of your hard drive. Norton has the ability to be customized and will scan all sorts of file formats including Zip, MIME, HTTP, and many more. The heuristics are configurable and Norton can be made to be very sensitive. Norton will also not allow you to touch your MBR, just try the 'fdisk /mbr' command when the default settings are loaded. Norton will go postal. In conclusion, the best just got better. It is not only a good product for neophyte users, the changes made in this version also make it attractive to powerusers and developers. Norton is a must have, even if one has a PC which came preinstalled with another Antivirus suite. There are some of us that provide our own virus protection, but this added measure of security makes for peace of mind. The first time Norton can repair or quarantine an infected file, it will surely pay for itself.